The Turbo 1000 can glide through the neighborhood and transport you from Point A to point B in great style. With a 100watt Brushed 36v 3000rpm motor, the scooter is powerful, to say the least, The 36-volt batteries are deep cell lead acid batteries that can last you a long time when you cruise. Any rider up to 220lbs will be able to enjoy this scooter when they go out. Hills and inclines are this scooter’s forte, and it comes in three colors: black, green and red. You will also get a LED light and a big removable saddle for ultimate comfort! Thanks to the Super Turbo 100watt Brushed 36v motor, the Super Turbo is a great labor-saving device that is 100% efficient in many ways. It can also spin at 3000rpms, which means that reaching speeds of are not uncommon with this scooter. This is definitely an upgraded motor mechanism when you compare it to the ones featured in the previous Super scooter series. Since the Turbo 100watt is an improvement from the previous Turbo 800watt scooter, many features have been significantly enhanced and boosted to give the electric scooter rider the best, optimum riding experience. 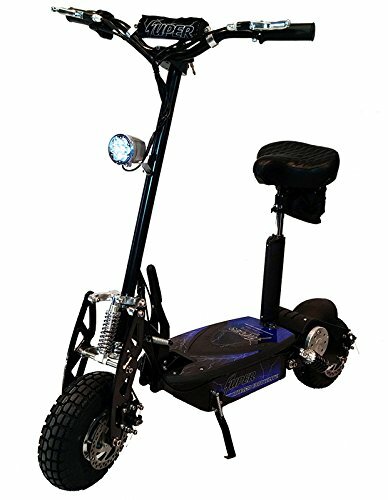 The upgrade that Super made to make this scooter 1000watts, makes this Super Turbo extremely reliable in many aspects. You will be able to ride up steep hills with no drawback, and speeding through rough roads will be a breeze thanks to the powerful motor which can drag you through all obstacles in your way. The sprockets and the chain have been updated to more durable, heavy-duty designs which will last longer, and take a lot more of wear and tear. The increased size of the chain and the depth of the teeth allow the chain to stay in place firmly. You won’t have to be worried about this chain falling off when you’re cruising, that’s for sure! The frame build is solid and can support the rider comfortably throughout their journey. The handlebars are fully responsive and sensitive to turns, and it’s a given that you will be able to arrive wherever you need in style and confidence. The frame itself is made from durable high-tensile steel that will be able to take all the racketing with pride when you ride over rougher roads. A great feature of the Super Turbo that many people seem to purchase it for is its foldability. When on the road, having portable gear is vital and necessary. While the original size of the frame when unfolded is 42”, this scooter can deceptively be folded to be a device of only 17”. This is a great, ideal size to have when commuting in trains and buses or when taking your scooter for a trip outside of your own town/country. It doesn’t get in the way, has a compact easy-to-carry design and can be slid anywhere you find suitable. This can also be a useful feature within the household, especially if you live in a flat. The brake of the Super Turbo is located within the front tire, which connects to the handle. You will be able to easily control your rides wherever, and whenever you need. The brakes themselves when used are very responsive and will prevent you from running into danger and accidents if you use them quickly and effectively. As long as you have fast reflexes, the Super Turbo will keep you safe and secure while you are cruising on busy streets. All in all, the scooter has two disc brakes on both wheels to ensure a fully-protected journey. The front brake discussed above is the mechanical single actuation disc brake, while the one located at the rear end is a back mechanical since actuation disc brake. The thing that everyone should take notice of is the fact that Super took extra time to improve the front brakes as well make the disc brakes larger for maximum support. 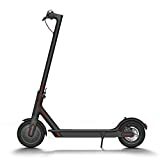 One thing customers reported is that they never ran into any problems with the scooter when it concerns stopping safely, which makes this scooter the ideal candidate for your young family member that needs some electronic gliding adventure in their lives! To make your commute smooth and effortless, Super decided to supply their Super Turbo 1000 scooters with rubber wheels that cause just enough friction to stay safely on the road, but little enough to keep gliding when on smooth terrain. Both the front and back wheels are pneumatic and can easily ride over small cracks and bumps that you may encounter along your way. The 10.5” chunky tires can handle rough asphalt as well as smooth boulevards and are perfect all-terrain candidates for anyone who needs to ride over various surfaces in their everyday commuting. Their adaptive quality to all terrains equals from the fact that they have a deep tread design that allows the scooter to also ride off-road when needed, without much trouble and without damaging the scooter. The rear and front shocks also help in keeping the ride less bumpy and more pleasant when going over curbs and gravel in general. One thing to mention about the sturdy ABS Resin wooden deck of the Super Turbo is that it also supports a seat. It’s assembled within the USA, and the seat is 100% removable for ultimate convenience. Whenever you’ll want a standing-up ride or a seated ride, you can adjust the bars accordingly and have either. The seat itself is also very adjustable, so getting cozy shouldn’t be a problem for anyone. It can be adjusted from 29” high to 35” high when measuring from the ground up. This vast difference of 6” proves to be ideal to help support all kinds of rides of all heights and sizes. The seat is also padded so that you won’t be hurting from sitting on a hard, cold plastic seat for 24km! The foam fits nicely around the seat and a sturdy cover is wrapped around it to help prevent tears caused by everyday wear and tear. The Super Turbo has great maximum speeds that allow it to speed as much as 32 miles per hour. This is a great distance ratio for those who are planning on using the scooter for to-and-from school commutes or to-and-from work rides. Even around-the-neighborhood trips can be made much easier and much faster with the Super Turbo by your side, or rather under your feet. The speed, however, will naturally vary since every rider is different, has a different height and weight distribution and the terrains where they ride also vary greatly. Naturally, the scooter will move slightly slower on rougher terrains and that’s why in general, the speed of the scooter can be different depending on how you are built, and where you decided to ride. It’s important to remember that the 32mph estimate refers to how fast the scooter can ride with an average sized rider, on a completely smooth surface. Overall, you’ll be able to reach the 32mph speed within 15 seconds, and you’ll be well on your way wherever you need to go within 30 seconds. The speed can also be controlled by the accelerator installed within the scooter. The two modes that you can choose from are Turbo and Econo. To choose either, you just have to press the according button and take off. The Turbo mode will allow you to go full-speed immediately, while the Econo will give you an eco-riding speed where you will be able to journey long distances. The battery featured within the Super Turbo is a 36V-12ah lead corrosive battery. This means that you will be getting both a fast charging time and a powerful performance. Every time you ride, you will be able to look at the light display to see how much battery you still have left until you have to manually commute with the scooter. This is an extremely helpful addition since it helps to judge the distances you can travel based on the information provided by the display. Sometimes running out of battery half-way without a warning can be dangerous, and this feature helps save you all worries concerning that. The charging time of the Super Turbo equals to about 6-8 hrs, which is at least half as much as the other scooter available on the market today! You will also find the Turbo and Econo mode displays next to the display for the ultimate convenience. There will be no need to fuss around with too many buttons, everything is presented clearly and is fuss-free to manage. You will be getting a headlight with the scooter that will help you stay safe when dawn sets, and an LED rear right that is an option, but also provides a good amount of safety when traveling at night. The Super Turbo has a key switch ignition, and all in all remains to be a very secure scooter. You will be able to get access to the battery pack located within the deck easily should need be, and you will also be getting a 1-year warranty. The scooter itself can handle at least 220 pounds of weight, has a padded seat, a headlight, and shock absorbers. With all these features you can travel at least 18 miles per charge, and you don’t have to assemble the scooter at all. The Turbo is made from durable, sturdy materials which make it a bit heavy (about 92 pounds). That’s why giving it to very young kids may be a bad idea since they can easily trip and get bruises if the scooter happens to fall on them. The Super Turbo is the ideal electric scooter for young adults and teens over 14 years of age. Due to its weight, as we mentioned, it’s not ideal for younger kids since accidents can be serious if they are not careful. College students or adults who want to commute to and from work and have a less than 18mile road there and/or back will find the Super Turbo to be the perfect solution. There are many things to like about the Super Turbo, it’s compact, efficient, and can be driven on various terrains. No matter where you find yourself, you can be sure that you will be able to rely on this trusty little scooter. It’s powerful, and heavy-duty, and can handle quite a lot when it comes to wear and tear. Commuting with cars can sometimes take too long, and polluting the environment certainly isn’t helping anyone, that’s why the Super Turbo can be a fantastic solution for quick trips from point A to point B!